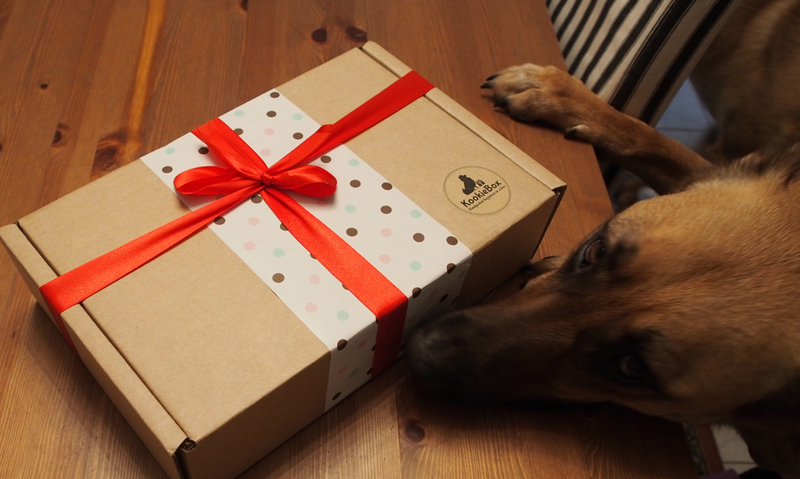 KookieBox is a monthly subscription box service for your dog and is to our knowledge the latest thing in doggie surprises to hit the internet for Australian dog lovers. Basically, they pack a selection of high quality dog goodies into a surprise box, wrap it nicely and send it to you every month. The first step is to fill in some details about your dog (small, medium or large breed) on their website and also mention any specific requirements he or she may have – allergies, strong chewer etc. Then you will need to choose your plan: you can order a box for a special occasion (Birthday or Christmas) or for the truly spoilt pooch, you can opt for the 3-month, 6-month or even 12-month plan, with the peace of mind of being able to cancel at any time. We were told to expect four or more handpicked, high-quality items in our box which could include anything from nutritious treats, stimulating toys, cool accessories to hygiene products. 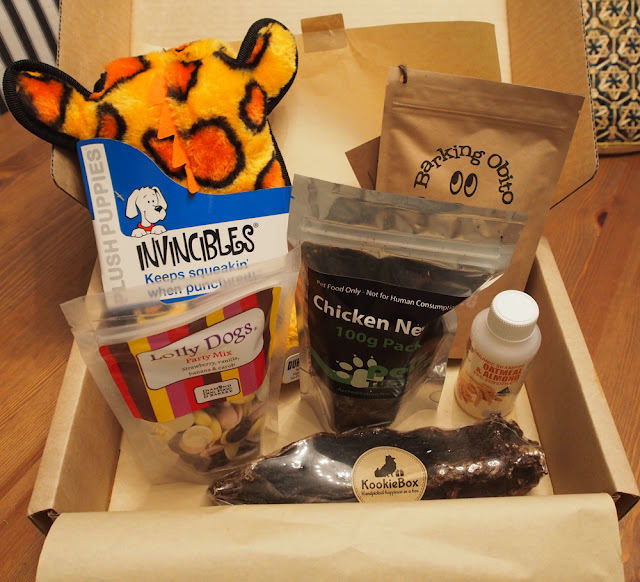 KookieBox works with local Australian suppliers for their edible products and always ensure that the treats are human-grade and safe for your furry friends. The toys and accessories are sourced from all over the world to bring a variety of products for your dog, which matters if you’re going to join the monthly subscription service. What is in a typical box? 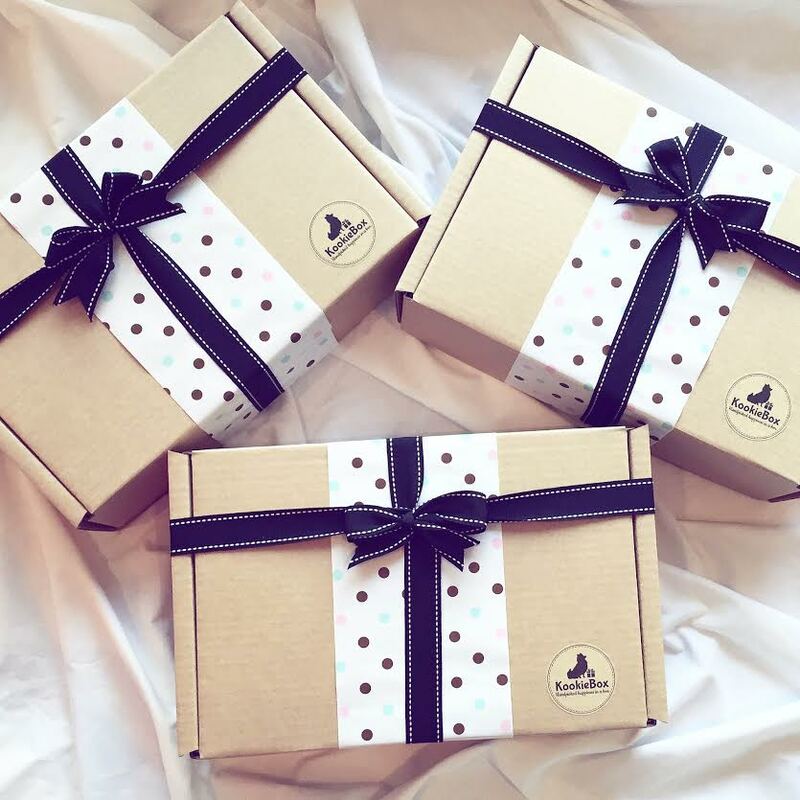 Our November box - beautifully wrapped in polka dot paper and tied with a red ribbon - was delivered to our front door first thing in the morning by courier and it immediately set our pack of hounds on the path to sensory overload! Our three resident dogs were the happy recipients of the larger size box, which contained a colourful “Plush Puppies” squeaky toy from Kyjen, a 125ml bottle of Smiley Dog’s Oatmeal & Almond organic shampoo as well as a range of tasty treats guaranteed to make any dog drool and certainly explained our dogs’ enthusiasm at delivery time. Each treat item was individually packaged including a Lolly Dogs’ Party Mix bag from Diamond Dog Food & Bakery, a pack of Chicken Necks and a Roo Tail Chew from Petz Tucker and, last but not least, a new range of “Howl-O-Cookies” (perfect for Halloween parties) with tasty kangaroo and healthy cranberries from Barking Obito. We did appreciate the fact that all food items are clearly labelled with a 'Use By' or 'Manufactured Date' to ensure that our dog treats would be sampled at their best - not that they would last long in this household! Plan options are flexible and if you have a new puppy, you can start with their small size box and later login into your account and update your subscription size to meet your growing dog’s needs. This service also comes with a 100% satisfaction guarantee so that if any aspect of your KookieBox delivery was not meeting your satisfaction, they promise to make it right. You can place an order for your own furkid family or organise a gift for a fellow doggie-parent under their 'Gift' option. All you need to do is pick a package and enter a personalised message for the lucky gift recipient, and they’ll take care of the rest. KookieBox will ship your box on the 5th of every month, as long as you get your order in before the last day of the month. Shipping is free Australia-wide and it takes between 2-10 working days to receive your box. Our verdict on the KookieBox service - as complete “newbies” to delegating the product selection to a third party – is extremely positive both in terms of the quality of each individual item and the personal customer service offered by this new provider. There is definitely a lot of love going into choosing the products and packaging them for you. Yes, there are a lot of monthly boxes out there and some subscription fees are cheaper but would you prefer to have supermarket treats repackaged and sold to you at a premium price or deliver something truly unique and healthy to your pet? We also love the fact that KookieBox donates a percentage of their profits to actively support rescue groups all over Australia. With Christmas just around the corner, why not trial a box for your furkids? For more details on plan options (starting from A$47/month) or to order your own box of doggie delights, please visit the KookieBox website.